“I know it’s God because I can’t explain who else it would be,” Sonni says as she laughs. 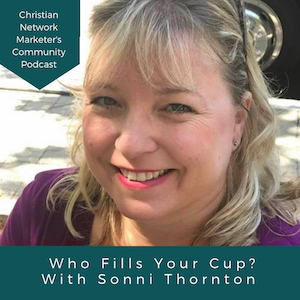 Today, I have an interview with one of our community members and my new friend, Sonni, and we talked about how God is working in her network marketing business. After chatting for a few minutes, we started recording and let Sonni take it away! God is making sure I have continual sources of personal development. There are always ups and downs, things to celebrate, things to cry about, things to pray about. Right when I feel like I have it all figured out, something happens that shows me how much I need God in my life, in my business, and that my success is only dependent upon Him, that I couldn’t do it on my own. We, as Christians, need to know where our source is, our ever-flowing fountain, and who fills our cup. Knowing this helps us remember that when things get unbelievably challenging, we have this refuge and we can get through it to bring us to a peaceful place. If I treat people as a friend, how would they respond to me? I look for common ground (maybe a product), then ask how they got there, which leads to them talking about themselves, and I just lean into that. Connecting and caring about people and then seeing what happens – treat them like a friend, they’ll treat you like a friend, then see what happens. Just keep doing what you’re doing and have a smile on your face.